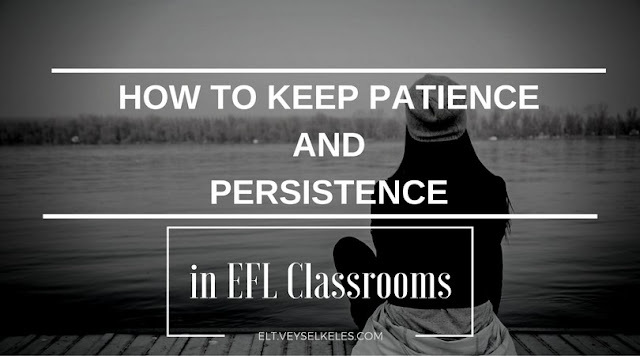 We as teachers are really impatient about our students' learning process. When we lecture our kids about a subject we assume that they understand it (probably because they said so) and will be able to remember it easily for the next lesson. And what happens when we go for that next lesson! RAGE! Because they don't remember it. They misuse what you taught them. We all face such behavior and it is obviously very common. One of my colleagues told me that she'd been teaching about "what's your name?" for a very long time and she was complaining that she tried many techniques to teach that subject yet the students are not still aware of the phrases. Well that is wrong to me! What she should do is to go on teaching what's next in the curriculum and you should do that too. Because, we need to know that English as a language is a whole and everything is all connected. We need to give time and leave it to time. But never ever we should give up our struggle and love of teaching. Learning is a process. We shouldn't rush it for only one subject. And we should keep our patience. When you do a lot of activities about the same subjects, kids would be really bored. You know what happens when someone is bored. The ears would be closed. New generation students are really curious about new things. We should use that curiosity as advantage. What we really should do is a regular repetition rather than trying to teach the same subject for a long time. Continue teaching what's next before you are out of school time. Students need to be exposed to as many phrases and words as possible in the target language because that's how they will get used to hearing new things and start getting curious. Curiosity is the key for kids and patience is the key in teaching language. I really would love to hear your thoughts about this. Maybe I'm mistaken or just couldn't make it clear. So what's on your mind?